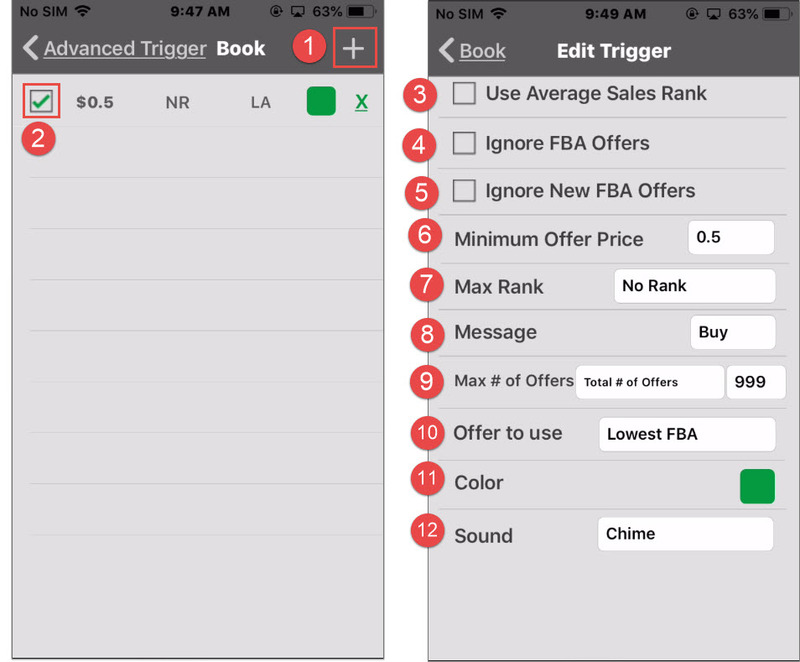 Advanced Triggers allow experienced sellers to have more customization to set up a trigger. Check this box (2) to enable the trigger. Enable whether to use the item’s Average Sales Rank (3). This is a more accurate measure of popularity as it takes into account the item’s past 6 months of sales history. If you check Ignore FBA Offers (4), the app will select the offer price only from Merchant Fulfilled (non-FBA) offers. If you check Ignore New FBA Offers (5), the app will select the offer price only from Merchant Fulfilled and Used FBA offers. Set the minimum offer price (6) and maximum sales rank (7) of this trigger. In order for this trigger to signal the item as a ‘Buy’, the items’ offer price must be >= this trigger’s minimum price (6) and item’s sales rank must <= this trigger’s maximum sales rank (7). Set the message to appear in the decision box if this trigger signals the item as Buy (8). The maximum number of offers for this product on Amazon (9). If the number of sellers is greater than this number, the item will not be listed as a ‘Buy’. Choose which offer to compare (10) against the minimum offer price (6) of this trigger. Set the background color for the Buy text (11), if this trigger signals the item as a Buy. Play a sound or vibrate (12), if this trigger signals the item as a Buy. The trigger will automatically save when you return to the trigger list screen. *If you enable any Advanced Trigger in a category, the Basic Triggers for the same category will not be used. If you want to use Only Basic Triggers in a category, you need to disable all Advanced Triggers in the same category. If you want to use both Advanced and Basic Triggers, you enable the Adv + Basic Triggers option in Settings here. To edit an existing trigger, you just tap it from the triggers list. After you scan a barcode, the app will get the offers’ price either from an offline local database or the Internet. The app will use the first trigger from the list. Based on this trigger’s settings, the program will select an offer from the offers. If its price is >= Minimum Offer Price (6) and its sales rank is <= Max Sales Rank (7), then this trigger will signal the item as ‘Buy’. The program will display this trigger’s ‘Buy’ message, background color and play its sound. Otherwise the app will use the next trigger from the list. The app will repeat this process until a trigger can signal the item as ‘Buy’, or it goes through all the triggers. If you enable the Adv + Basic Triggers option in Settings, the app will continue to use Basic Triggers to check. If not enabled, then the program will then signal this item as ‘Reject’.